Another slice, please. Photo by Romulo Yanes / courtesy of Stewart, Tabori, and Chang. Gather the gang, set the table, mix a cool drink, and indulge in traditional Portuguese comfort food. This recipe for salt cod, potato, and egg casserole is from by and chef George Mendes and Genevieve Ko. Then, in your post-meal euphoria, plan a trip to Portugal around the New York City chef's favorite restaurants in Lisbon and Porto. When I developed this recipe for my book, I couldn't stop digging into the Dutch oven and downing it by the forkful. 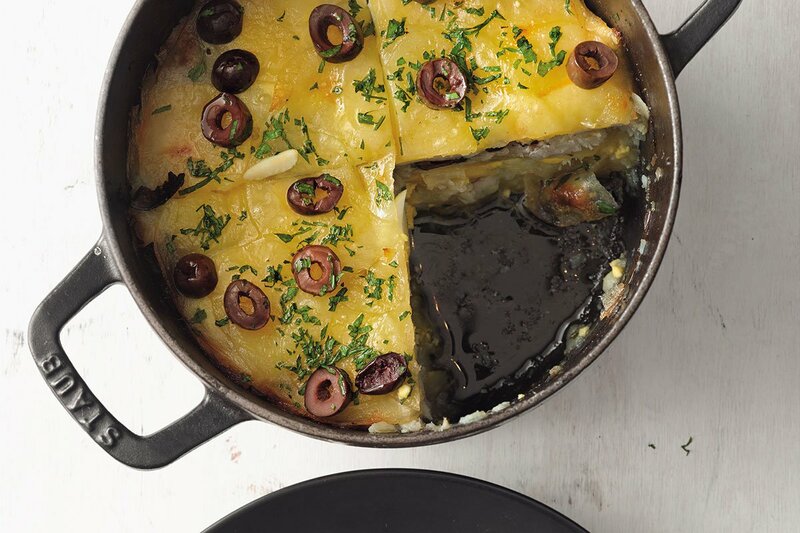 I stuck to tradition here because you can't beat the delicious, comforting classic mix of sweet onions and potatoes with savory salt cod and olives pressed into a homey casserole. 2 fresh bay leaves, notches torn every 1/2 in. 1. Preheat oven to 325°F (165°C) with an oven rack set 6 inches from the broiler and one set in the center. 2. Heat a small (4-quart) cocotte or Dutch oven over medium heat. Coat the bottom with oil. Add onions, garlic, bay leaves, and a big pinch of salt. Stir well, cover, and cook, stirring occasionally, until the onions are golden brown and very tender, about 10 minutes. 3. Meanwhile, cover the salt cod with oil in a medium skillet. Cook over medium heat, stirring gently until heated through, about 1 minute. 4. Peel the potatoes and use a mandoline to cut them lengthwise into 1/16-inch slices. Don't rinse them. You want all that starch. 5. Transfer the onions to a bowl. Discard the bay leaves. Coat the bottom of the cocotte with oil and sprinkle salt and pepper over the oil. 6. Cover the bottom of the cocotte with a layer of potatoes, overlapping the slices slightly. Season with salt, then cover with a thin layer of onions and 1 tablespoon of olives. 7. Layer potatoes, salt, pepper, oil, onions, salt, olives, and 1 cup of salt cod. Use a spatula to press down hard on the layers. 8. Top with a layer of the egg slices, drizzle with oil, sprinkle with pepper, and add another layer of potatoes. Press hard again. 9. For the final layering: add salt, oil, pepper, and the last of the onions, olives, salt cod, egg slices, and potatoes. Sprinkle with salt and pepper, drizzle with oil, and press down hard with your hand to get it as compact and even as possible. 10. Cover and bake on the center rack until the top is lightly browned and the potatoes are tender, 35 to 40 minutes. Spoon out any excess oil, then sprinkle with the parsley and more sliced olives. 11. Adjust the oven to the broil setting. Broil the casserole until the top is golden brown. Let cool slightly before cutting into pieces. By curing cod yourself, you get the delicate sweetness of the fish under an intense savory richness and smooth-as-butter texture. It requires only two ingredients and a little patience and planning. Do it: It's a revelation. 1. Four days before serving, spread 1/2 inch of salt in a 6-inch deep container. Place cod on top, skin-side down, and cover with the remaining salt, patting it against the top and sides of the fish. Cover tightly with plastic wrap and refrigerate for 48 hours. 2. Occasionally tip out excess moisture that's been released and evenly distribute the salt around the cod again. Rinse the cod under cold running water, then rinse out the container. Return the cod to the container and cover with cold water. Cover tightly with plastic wrap and resume refrigeration, changing the water every 16 hours. 3. Because the saltiness of the fish can vary, I start tasting it after 2 days. I want a slight salinity and will drain the cod when it's where I want it. Remember, you'll be using the cod in other dishes that you'll season again, so you don't want it to be too salty. Drain the cod well and use immediately. Buy , by George Mendes and Genevieve Ko. This recipe is excerpted from by George Mendes and Genevieve Ko. It is reprinted by permission of Stewart, Tabori, and Chang. У нашей организации полезный интернет-сайт со статьями про кофейные чашки.